It only takes a minute or two – then you’re ready to call your friends free over Skype, and even talk face-to-face on video. There are several ways on creating a Skype Account, but first, you need to download the Skype installer from their website. Once done, I will show you how to Register your own Skype. You can also use you Facebook account to register. 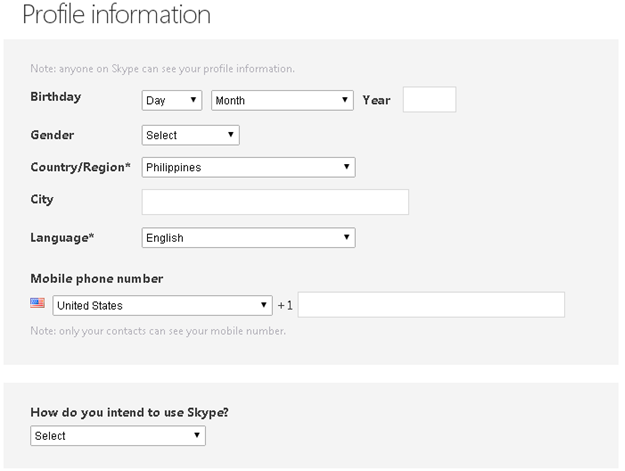 Next, you have to fill-in some important details which will be use later on upon signing in your Skype. Profile Information – on this one, you will have to fill-in form. But take note that anyone on Skype can see your profile information. You can edit the security settings later on. And Finally, You can now select your own Skype name and Password of your choice. I hope that the information I gave you cleared a way for you to create your own Skype account. After this one, you can now connect with me through Skype. Just click the Person with + (plus) sign and search my username on the search bar.